Cruising spinnakers require some additional rigging out - side of your usual heasail gear. To make it simple and convenient for you we have developed component pack - ages to help set you up with your first cruising spinnaker. Package pricing includes everything* you need to set your boat up for a cruising spinnaker at a discount off the individual component cost. 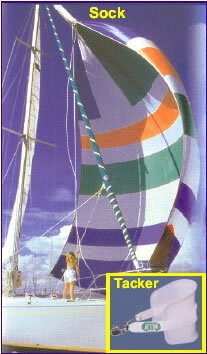 Stock Tri Radial Cruising Spinnaker colors are available in Red & White or Blue & White. *We try to anticipate everything you will need however in some cases a specific installation may require some additional components. Note number and location of panels vary somewhat by sail. Illustrations depict the general layout only. Discount package pricing is available for all boats. Buy a halyard, sock and Tacker and get 5% off the cruising spinnaker price!